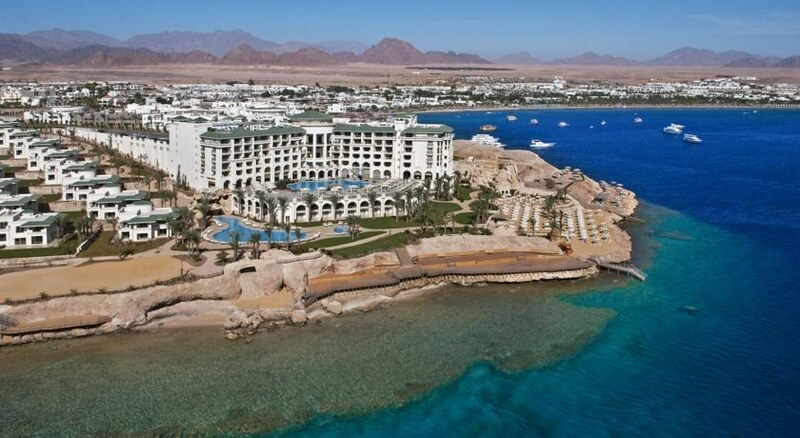 Sitting on a private beach at the scenic Naama Bay in Sharm El Sheikh, the luxurious 5-star Stella Di Mare Beach Hotel & Spa boasts spectacular views stretching over the land and sea. Apart from a free access to its exquisite private beach, the hotel offers a great variety of diverse leisure activities including swimming pools, health club and spa, golf course and water sports. There’s also a PADI-certified diving centre, which helps you discover the fantastic reefs through snorkelling and diving. Guests can make the most of the free bus shuttle service to explore at the town centre that is lined with a beautiful array of shops and restaurants. A clutch of fine restaurants and bars takes you on a gastronomic tour from the shores of Mediterranean to the Asian delicacies. The rooms at this magnificent resort come along with a private outdoor terrace or balcony that features sweeping views of the Red Sea as far as the view extends. 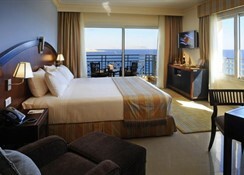 A magnificent seafront property located in Sharm El Sheikh, Stella Di Mare Beach Hotel & Spa is situated minutes away from the scenic Naama Bay and offers a free shuttle service to the same. 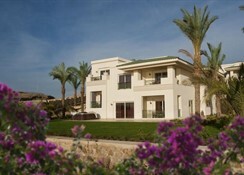 The airport is just 17 km away from the resort while the old town sits only 3 km away. The popular Ras Muhammad National Park is 20 km from the property. 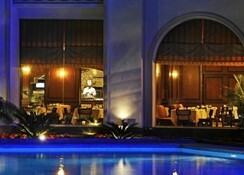 For food and beverage, the hotel provides a choice between three main restaurants. At La Terrazza, guests can enjoy local and international delicacies in buffet or a la carte style for breakfast, lunch and dinner. 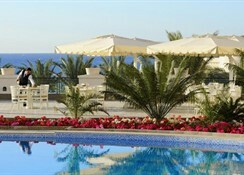 Corallo Rosso Restaurant, next to the pool, serves modern Mediterranean cuisine. The ocean-facing La Scogliera Restaurant offers contemporary Asian cuisine. 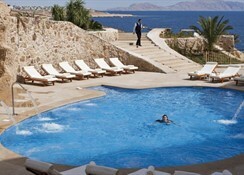 It also features a Sushi Bar where you can taste exotic delights while admiring views across the sea and Tiran Island. 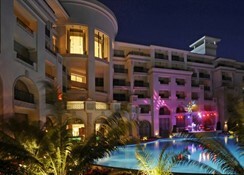 The hotel features a number of bars, which includes Bella Vista Lobby Lounge, Chill Out Pool Bar, Beach Bar and Ritrovo Bar. The La Dolce Vita Gelateria & Bar serves home-made ice creams, fruit juices, smoothies, milkshakes and other drinks. Fancy snorkelling in coral reefs or spend a lazy day by a lagoon-style swimming pool surrounded by waterfall and tropical gardens – Stella Di Mare Beach Hotel & Spa has it all to keep guests engaged. Besides the 2 adults’ swimming pools and 1 kids’ paddle pool, the resort accommodates a fitness centre that offers a wide range of fitness programmes and a spa that provides steam bath, Turkish bath, saunas, hydrotherapy, Jacuzzis and massages. Whether the holidaymakers wish to indulge in active sports or are out for a bit of pampering, the resort has various a PADI-certified diving centre for water sports, a 9-hole golf course, tennis court, table tennis, beach volleyball and billiard tables etc. in store. For its younger guests, the mini club of the resort organises day and night animations, entertainments, live events, gigs, disco parties and games that provide unlimited fun.